This website contains the main outputs of a three year multidisciplinary project led by the Mackintosh Environmental Architecture Research Unit (MEARU) at the Glasgow School of Art, in partnership with the Centre for Research on Indoor Climate and Health (RICH) at Glasgow Caledonian University and the Energy Systems Research Unit (ESRU) at the University of Strathclyde. 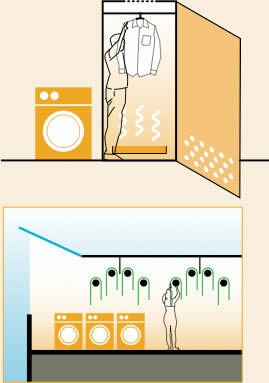 There are three main health risks associated with indoor drying, all relating to moisture. 30% of moisture in homes is attributable to clothes drying on wash days. Current housing has a lack of dedicated drying spaces, utility rooms or other suitable spaces in which to dry clothes within the home. Not only can the sun, even in Scotland, help to dry our clothes, it is also a natural disinfectant. The scope of the study involved a survey of 100 households in Glasgow, in—depth monitoring and analysis of 22 of these, laboratory analysis of air samples and the affect of moisture on materials and advanced moisture modelling. 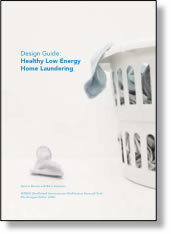 The Design Guide: Healthy Low Energy Home Laundering is a key output, aimed at all those involved in housing procurement, and recommends changes to statutory standards and best practice. The study found that current practice consumes too much energy and compromises health, and therefore implementation of the guidance would have significant economic benefit. The Design Guide is augmented by technical reports from the three research units and links to related technical papers.